Most public transport in the Vienna area is organised in the fare union “Verkehrsverbund Ost-Region” (VOR). Any ticket bearing the VOR symbol can be used on almost every means of public transport in the area. You can use the same ticket for a journey that involves trips by bus, tram, metro and/or train, and you can change as often as you have to without having to buy a new ticket. 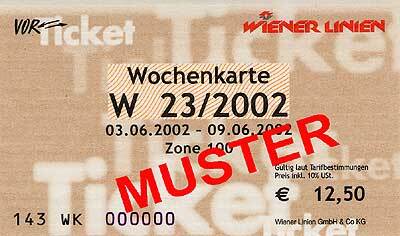 VOR tickets are not valid on the private Westbahn trains, on the City Airport Train CAT, and on the Vienna Airport Lines airport buses. There is a flat fee within the Vienna city boundaries. Only if you leave Vienna do you have to pay for an additional ticket. This may concern tourists in so far as the airport is outside Vienna. Fares quoted below are valid as of January 2018. Single ticket €2.40 Valid for one journey within one zone. You can change as often as is necessary, but you may not travel on a circular route or go back to your starting point. Costs €2.60 if bought on a tram. Half price ticket for children and dogs €1.20 Valid for one journey within one zone. Senior citizens' ticket €1.50 Valid for one journey for senior citizens over the age of 62. 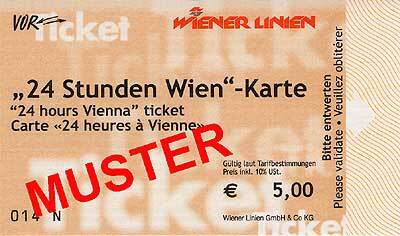 €17.10 Valid for unlimited travel for one adult within Vienna. Valid 24, 48 or 72 hours from the time of validation. €24.90 Valid for unlimited travel for one adult and one child under 15 years within Vienna for 24, 48 or 72 hours, plus discounts or benefits at museums, sights, theatres, concerts, shops, restaurants and cafés. Available at hotels, Tourist Information Offices, at Vienna Transport (Wiener Linien) sales counters and information offices, or from outside Vienna with your credit card by phone +43-1-798 44 00-128. Click this link for more information. 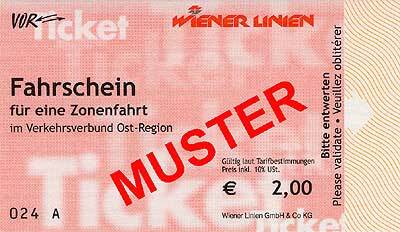 8-day ticket €40.80 Each strip on this ticket is valid for unlimited travel in Vienna for one person on the day of validation until 1:00am of the following day. This means that the ticket can be used by more people, provided they stay together and validate one strip per person. This is not a 24-hour ticket! 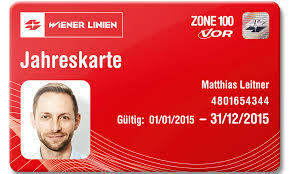 Weekly travel pass €17.10 Valid for unlimited travel in Vienna within the specified calendar week (Mon-Sun). This is not a 7-day ticket! 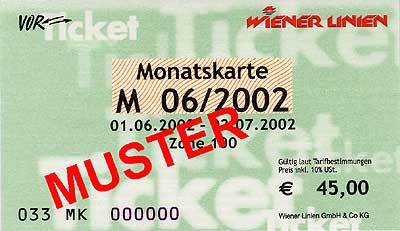 Monthly travel pass €51 Valid for unlimited travel in Vienna within the specified calendar month. As the airport is outside the city area, an extra ticket is required. Please refer to the airport connections information page. Children up to the age of six travel free of charge on the Vienna public transport network. Children up to the age of 15 travel free on Sundays and public holidays and during the school holidays in Vienna (this includes the week before Easter, July 6th through August 31st, and Dec 23rd through Jan 6th). An ID card may be helpful to prove a child's age. Yes, it is possible. No, it's not advisable. Plain clothes ticket inspectors patrol the public transport network at all times. If you are caught without a valid ticket, you have to pay a penalty fare of €105 (this includes a free trip to the nearest police station if you are unable to show the ticket inspector a valid passport or official ID). Bear in mind that a monthly travel pass is available for less than half the amount. Ticket machines in trams and buses. Avoid these if you can. They offer only single tickets and tickets bought from these machines are more expensive than those bought elsewhere. WL ticket offices. Look for the sign 'Vorverkauf' ('advance tickets'). They can be found at all major metro stations and some tram stations. They are marked with a K on the city transport map. Most tobacconists ('Tabak Trafik'). However, not all of them sell tickets. Those who do usually have a blue sign with the WL logo (see above) at the door.